Largely due to holidays and work, for the first time in months, we only had enough players for one game. Blue and Pink were first to arrive and, while they were waiting for their pizzas, they played a quick game of Honshū. This is a game that Blue had played with Black and Purple about a year ago when Black and Blue agreed it was a very, very clever game. Somehow though, it hadn’t got another outing until last week at the Didcot Games Club, when Blue introduced Pink to it. He really enjoyed it and was keen to give it another go. It is a trick taking game, so it plays a bit differently with two. The idea is that players start with a hand of six cards; two cards are drawn at random from the deck to make one pool, and the players play a card each to make the second pool. Each card features six districts and a number – the player who wins the trick by playing the highest number chooses one pool and then chooses a card from that pool. The other player does the same with the second pool. 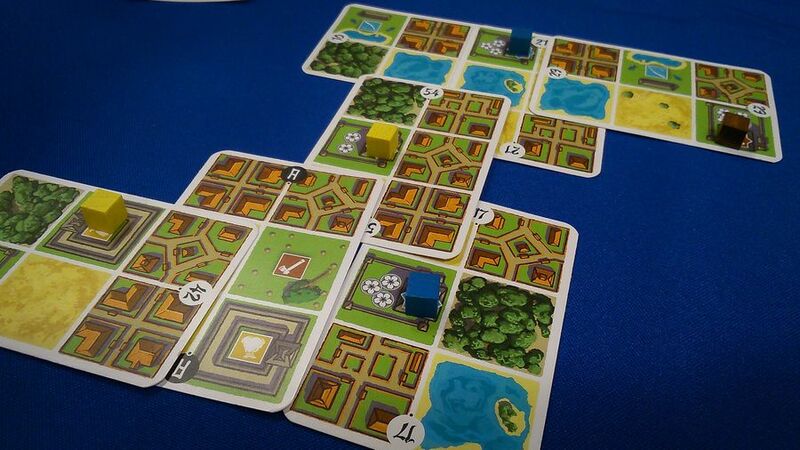 The players then add the cards to their city. Each card is divided into six districts, each of which scores in a different way at the end of the game. For example, every district in their largest city, players score a point. Similarly, all forest districts score two points. More interestingly, a single water district is worth nothing, but water districts connected to it after that are worth three points each. Perhaps the most interesting are the factories which only score if they are supplied with the appropriate resources, wooden cubes that are placed on resource producing districts. These resources can also be used increase the value of cards when they are played, in the two-player game this is only by the losing player who can guarantee a win by paying a resource. One of the biggest challenges is choosing the cards though. When the cards are placed, players must take care to make sure that they either partially cover (or are covered by) at least one other card. 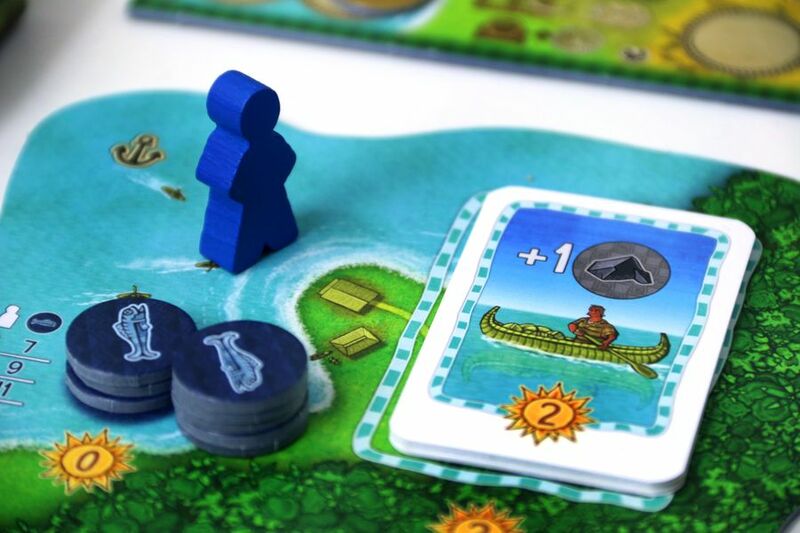 This, together with the fact that players are trying to expand their largest city and any lakes makes choosing and placing a card really difficult as there are many options to explore. Despite playing it a couple of times, neither Blue nor Pink have really understood how the game plays which is probably what makes it interesting. After the first three rounds, in the two-player game, players swap their remaining three cards and are supposed to add another three (repeating this after the sixth and ninth rounds). Unfortunately, Blue misunderstood the rules for some reason, so instead, they swapped hands after three tricks, refreshed their hands to six cards at half-way and swapped hands again after nine. This simplifies the game a lot, as the obvious strategy is to play high cards early and then hand all the dross over to the other player who is forced to play them. 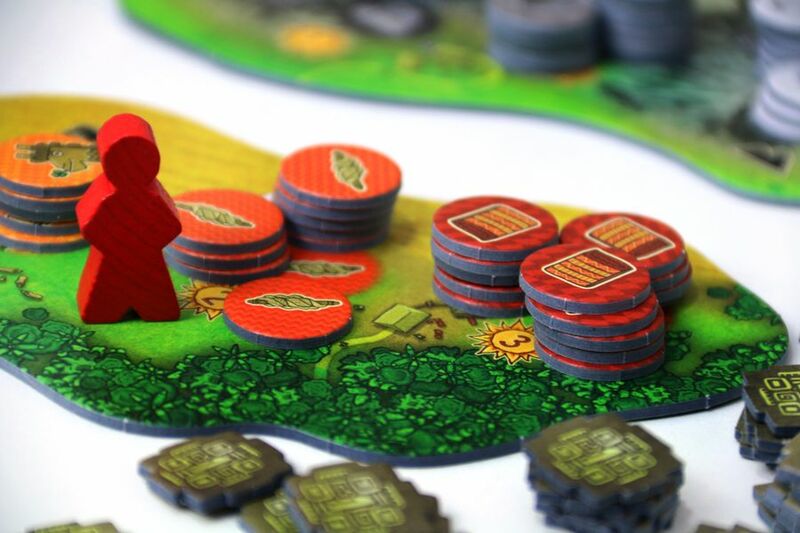 It also introduces a lot of luck, and while we like luck in the right place, the game would definitely be more interesting with the rules as written. Blue won, but it is definitely one to play again, and correctly this time. 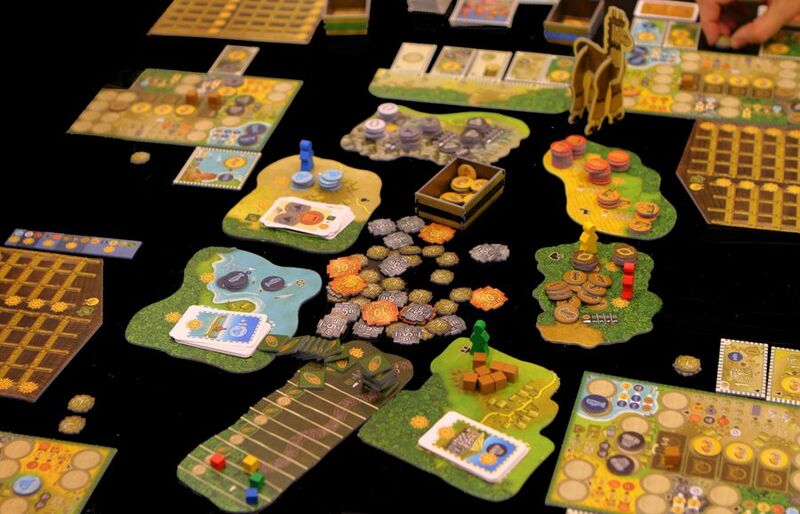 With Burgundy’s arrival and then Green’s, and food out of the way, we moved onto the “Feature Game”, Altiplano. 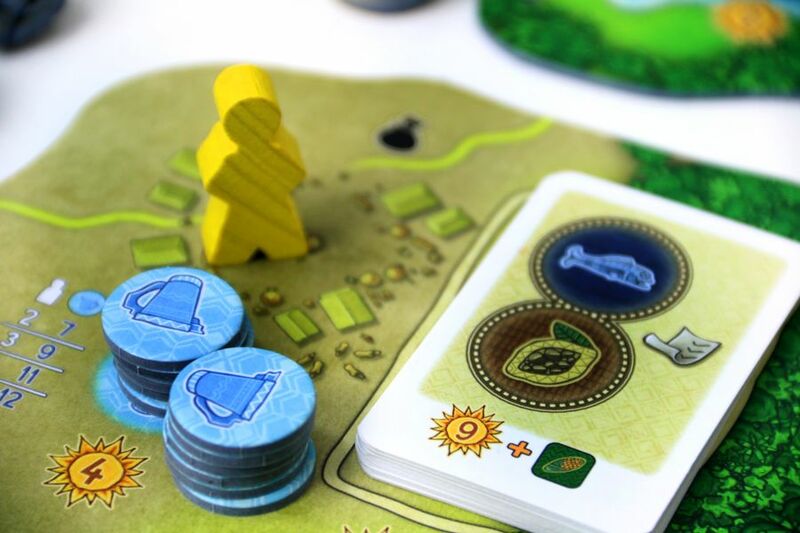 This is a bag building game that re-implements some of the mechanisms found in one of our more popular games, Orléans. 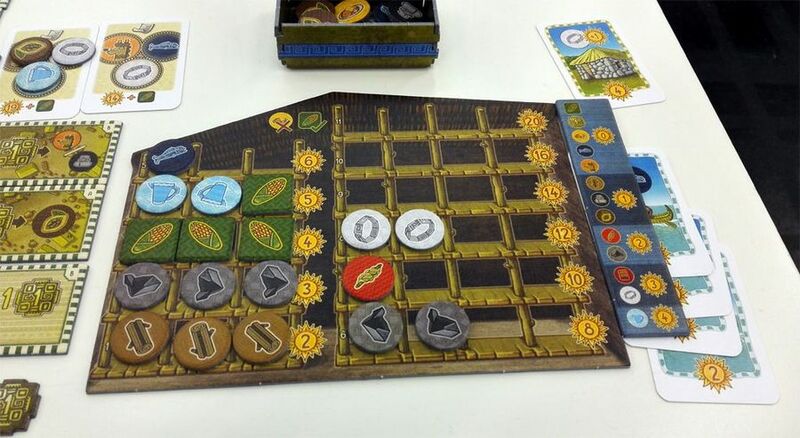 Like Orléans, Altiplano has two phases: planning and carrying out. 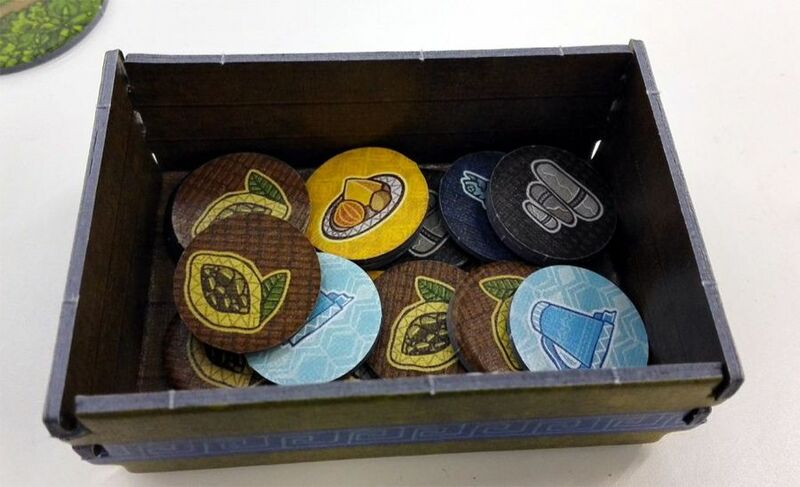 The idea is that players start off with a handful of resource tokens and, on their turn can draw a number of these out of their bag, placing them on their personal worker board. Simultaneously, players then place them on the action spaces on their board. This usually takes a little time as everyone is trying to maximise their return. And this is where it differs significantly from Orléans where everyone can more or less do whatever they want, whenever they want. 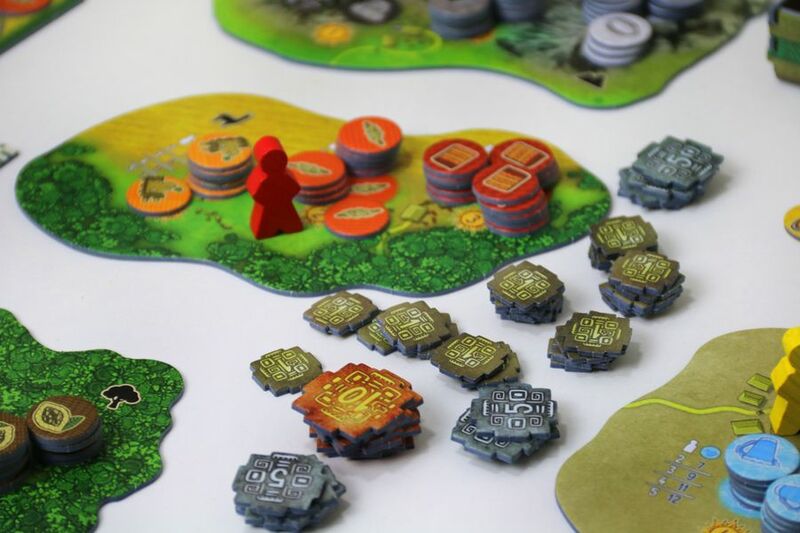 In Altiplano, there is a central circle of locations, and actions can only be carried out when player’s meeple is in the appropriate area. There are seven locations and players get one movement of a maximum of three spaces for free on each turn. This means it is possible to get to any location, but only one of them, unless they pay a food token which will allow them another move, but only a single space. Thus getting the planning right is essential. It is possible to get rid of resources: they can be placed into the player’s personal warehouse. Once they are in the warehouse though, they can’t be taken out again and as all resources are limited, it may not be possible to obtain a replacement. 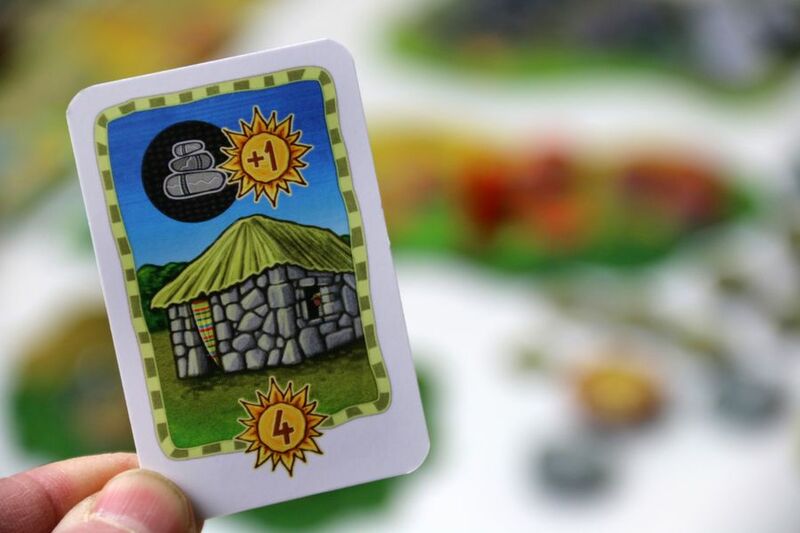 Placing resources in the warehouse is done by visiting the Village and is a useful thing to do as it is one of the ways to score points. Most resources are worth points at the end of the game, but in addition to this, full shelves in the warehouse score bonus points. Each shelf can only hold one type of resource, and the higher shelves score more points. Getting resources is therefore important, but they have to be the right resources as the warehouse isn’t the only strategy available. At the Village location, players can also buy Hut cards which depict one resource and give players extra points for that resource at the end of the game (as well as a little bonus). In the Market, it is possible to “sell” goods (they still go back into circulation though), and buy Contract cards which give points when completed. Players can only work on one Contract at a time, but once they are finished, they can be worth a lot of points. The Market will probably be one of the most visited locations as players can also buy “Extensions” to their player board. These are really key to playing the game well, as without them there are lots of resources that are difficult to get. In addition to the Village and Market, there are five other locations to visit: the Farm, the Forest, the Mines, the Harbour and the Road. The first four of these are mostly about using one sort of resource to get another (e.g. 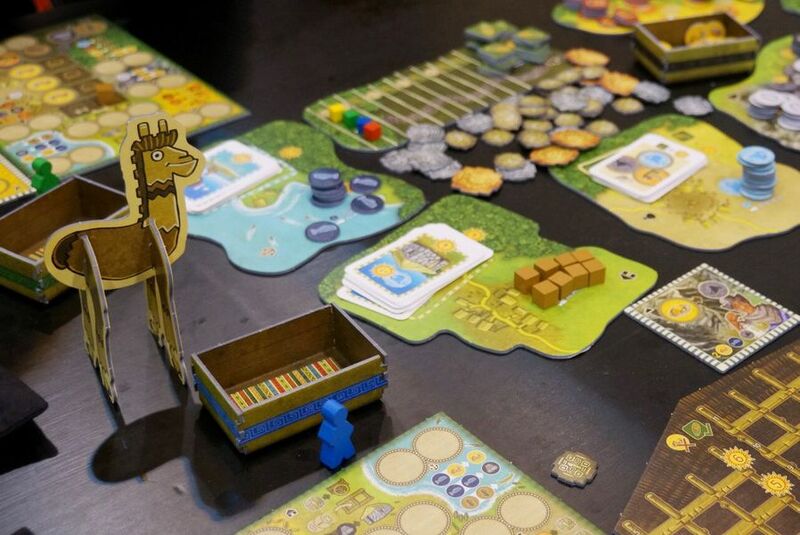 using an alpaca and some food to get wool, or using two fish to get stone). All resources acquired in this way go into the recycling crate to be used on a later turn. 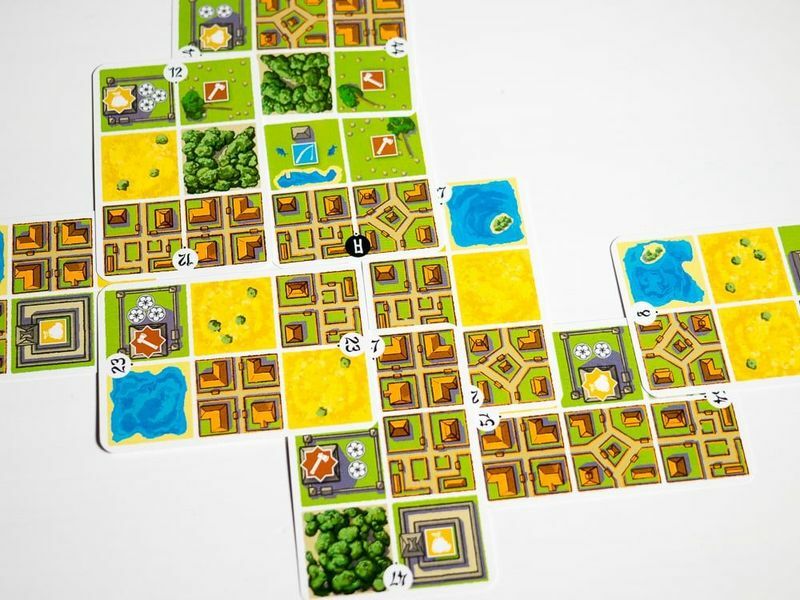 The Road is slightly different as it features a track similar to the Knights track in Orléans, and players’ position on the road dictates how many resource tokens they are allowed to place in the planning phase. Like Orléans, players don’t have to place their full quota of tokens on action spaces, but these will block spaces for their next turn if they don’t (which can be doubly damaging as it prevents more useful things coming out of the bag). The Road has to be built though, and it costs a wood and a stone to travel along the path. Some steps give Corn instead, and this has to be placed in the warehouse, but it can be very useful as it is “wild”, so can help fill those difficult rows where resources are scarce. 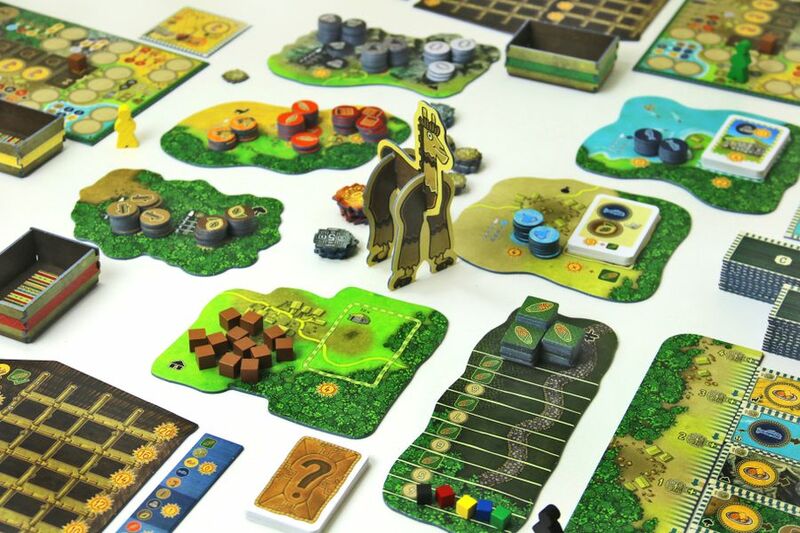 The game is not terribly complicated in itself, but there is a surprising amount of thinking to be done and, like all great games, players always want to do many more things than they are able. Blue had played Altiplano with Pink a couple of times, and Burgundy had read the rules and watched a video, so the rules explanation was really for the benefit of Green. Unfortunately, he was too interested in playing with his phone to pay attention, which might explain why he made such a mess of things later on. To be fair, everyone was interested in the difference between an alpaca and a llama (apparently llamas have long banana-shaped ears and are roughly twice the size of an alpaca, but alpacas have softer fleece and are a bit more skittish). We all had a good laugh at the jumping alpaca footage too, but even after all that and everyone else focussed on the game, it was clear Green’s attention was elsewhere. At the start of the game, everyone gets a character card which dictates their starting resources and gives them a special action. Green was the Woodcutter, Blue was the Shepherd, Pink was the Miner and Burgundy was the Farmer, giving them access to Wood, Wool, Ore and Alpacas respectively. Blue and Green started with only three resources (and an extra coin), which didn’t seem to bother Green much. Blue felt it was a big disadvantage though, especially as it wasn’t clear to her what strategy the Shepherd encouraged. In the absence of anything better, she started off going to the Market and buying an Extension, and using her Alpaca to make some Wool in the hope that things would become clearer in time. Green on the other hand, began with the obvious tactic and used his Woodcutter to get some wood. For Burgundy, the priority was to increase the number of resources he was able to place in each round, so he began by trying to get the stone he needed to start building his road. Pink had a two-pronged strategy, planning to go for the three point resources (especially Silver as he had the Miner which meant he could get plenty of Ore). This was because they were less difficult to get than Glass, but were still worth a lot, especially if augmented with a Hut bonus. So that was the second part of his plan: get lots of Hut cards from the Village as they give a small bonus anyhow, and by taking them he was depriving everyone else. As Burgundy started to build his road, Blue and then Pink decided to join him. Eventually Green followed suit, but it wasn’t until he was several steps along the road that it became clear that he hadn’t actually been visiting the road to build it. He explained that he didn’t think it was necessary as the road was different and it had been positioned very slightly out of the line of the circle due to the slightly cramped space. Everyone else had been visiting properly though, so if he’d been concentrating on the game and watching what others were doing (instead of playing with his phone), it probably wouldn’t have happened. Meanwhile, Pink was continuing to collect Huts and Silver, and Blue had another Extension, was buying lots of Cocao and using it to get Glass (or occasionally Food or Cloth). It was around this time that Green began to join Pink collecting Huts. Burgundy was just beginning to get his game off the ground when he got into a bit of a tangle. He had positioned himself to move onto his third step along the Road, but that gives Corn and he really didn’t want to take it yet as it would have to go into his Warehouse. Since he didn’t have any resources in his Warehouse yet, it would mean he would have to start a shelf with Corn. The problem with this is that any corn he got later would have to go on that shelf too, rather than padding out any other, scarce resource. Eventually, Burgundy managed to sort out his problem, but it took a couple of turns and set him back just long enough for Blue to buy the Extension he had his eye on (again). The game was entering its final stages and Blue began filling her Warehouse, trying to keep the size of her bag down. She was helped by the Extension she’d grabbed from under Burgundy’s nose which allowed her to place an extra item in the Warehouse on each visit. Everyone else followed, and began worrying about what they needed to maximise their bonus points. Everyone that is except Green, who was still fiddling with his phone despite the fact that his friend had apparently gone to bed. The game end is triggered when either there aren’t enough Extensions left to fill the Extension Strip, or one of the locations is completely exhausted. When Green took the last Glass token, everyone had just one more round to maximise their bonus points. Blue and Burgundy fought to try to get the last Extension that allows players to draw an extra ten tokens out of their bag and put them straight in the Warehouse at the end of the game. This time Burgundy won, as Blue discovered that she didn’t need it anyhow because she could use Corn to do the job, and as she didn’t have the right resources in her bag it wouldn’t have helped her in any case. Eventually, the game petered out as there was nothing more people could do and players began adding up their scores. Burgundy had struggled throughout and Pink’s experience and Hut strategy had worked well. It was very, very close at the front though with just three points in it, and much to everyone’s surprise given how much attention he wasn’t paying, Green finished just ahead of Blue with a hundred and six to her hundred and three. He was obviously pleased and professed to have liked the game despite not really focusing on it. It was when Burgundy commented on all the Wood and the Glass that he had, that someone asked where Green had got all the Glass from. As Green explained that he’d got one from a Hut, it all came out. Every time he’d taken a Hut card, he’d taken a resource (perhaps confusing them with Boat cards). He said it wouldn’t really have made much difference, although he wouldn’t have won as he’d have had fewer resources and therefore maybe ten points less, leaving him in second place. Burgundy pointed out that the advantage he got from all those resources during the game was incalculable, added to which, taking the last Glass ended the game early preventing others from scoring more. Normally nobody would have minded as everyone makes mistakes from time to time, but as Green had been playing with his phone all evening and not concentrating, we decided there was no cause for a llama, and just disqualified him. Learning Outcome: Playing with your mobile phone means you make mistakes which upset the balance of the game. 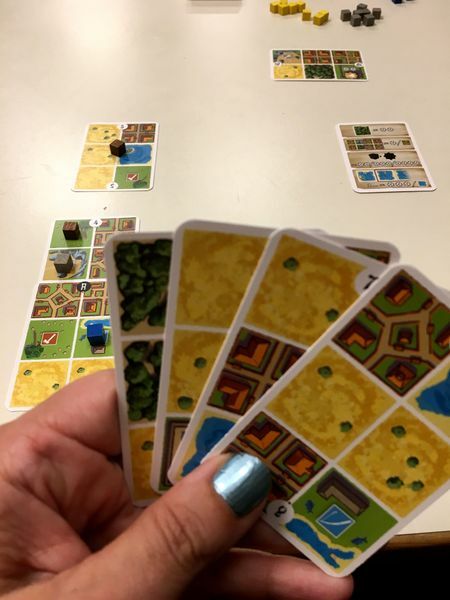 This entry was posted in Games Night and tagged Altiplano, Honshū, Orléans on August 18, 2018 by nannyGOAT.